Organizing your digital photos is a huge step in making sure that your memories are forever preserved. I haven’t always been great at digital photo file organization. It has been a struggle for more years than not. But I currently have a good system in place that has alleviated so much anxiety and allowed me to easily locate photos on the fly. My husband (fiance at the time) and I bought our first digital camera in 2001. It was a Kodak DX3600. A whole 2.2 megapixels. We thought we had won the lottery. We were the first in our family to purchase a digital camera so when the family got together, I was quick to grab my camera and snap a good 15 or 20 photos. To this day, when I look at my stash of photos from that time in my life, I can’t help but laugh. It took me a little while to get used to the idea that I could literally take as many pictures as I wanted. Nowadays, I snap more like 300 or more at any given family event. And that may be a slight under-exaggeration. Nevertheless, over the years, I have acquired hundreds of thousands of digital photos. Back in January of 2016, the holiday rush had come to an end, my boys were back in school and I was on a mission to finally organize all of my cherished photos, once and for all. 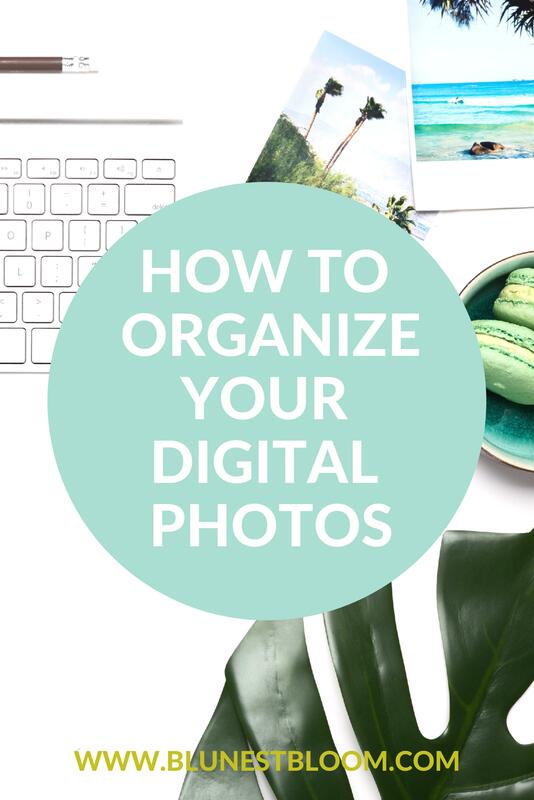 When deciding to organize your digital photos, the sooner you get started the better. I had 14 years of photos to go through and as a hobbyist photographer, I take my fair share of them. It took me many hours over the course of many weeks but if you aren’t quite as behind as I was then your job will be a lot easier and less time-consuming. Either way, the time you put into it will be more than worth the investment. My personal favorite way to store and organize my digital photos is by using an external hard drive. I have ALOT of photos so I actually have several external hard drives. In the past, I would store a couple of years per external hard drive but as I have delved even more into the world of photography over the years, I now store one year of photos on a single external hard drive. I prefer 2 to 3 TB hard drives but this is all strictly based on your needs. Not everyone will need the magnitude of storage that I require. I also take a lot of videos so much of my yearly storage is dedicated to the storing of those as well. The next step in organizing your digital photos is to set up folders by year and by month. First, you need to figure out what the timeframe of the photos held on your specific hard drive will be. For example, if your photos consist of photos ranging from 2014 thru 2017 then you will begin by setting up folders for each year and then within each year, setting up folders for each month. Once you go through and set up folders for each year and month then you will begin sorting through your photos and placing them into the year and month folder in which they belong. This can be tedious but just getting them in their respective year and month is huge. Be patient. Once this part is done then you will be that much closer to your intended goal. Another way that you can organize your individual folders is by event. For those of you who strictly take photos at special occasions and/or events then you can name your folders according to the event such as: Sarah’s Birthday, Christmas at Nana’s, etc. I have seen several people who prefer this method. Like I said earlier, this is strictly based on your digital photo needs. Finally, take the time to upload your photos regularly. This includes photos taken with your camera as well as your mobile device. I personally take pictures and videos with the camera I have on me, whether that is with my Canon 6D, my Sony A6300 or my Samsung Galaxy S8 Plus. I cherish the memories I have captured with each of my cameras and choose to store them all accordingly. Once you reach this point, you can let out a huge sigh of relief. You did it! You have officially taken over that plethora of digital “UGH” and helped restore your sanity. Congratulations! I know. It feels good, right?! One more thing and this step is not a step in organizing your digital photos but is just as important nonetheless. After satisfying your need to organize your digital photos, make sure you BACK THOSE PHOTOS UP. I can tell you from firsthand experience, hard drives fail and if they aren’t backed up, all of those memories will be lost forever. I learned the hard way when I lost all of my precious memories captured from our 2015 beach vacation. I still struggle with that loss. There are so many options when it comes to photo storage backup. You can choose to back up all of your photos onto a second hard drive or even upload your photos into the cloud. My choice for digital photo storage backup is by using Smugmug. I love their interface and the ease of uploading folders via the drag and drop function. Once you get all of the above done, uploading to a place like Smugmug is simple. So there you go! You are on your way to a less digitally cluttered life. Do you have a different method for keeping your digital photos organized? I’d love to hear other options for staying digitally organized.